"All right, okay, that's it. That is the fifth time in two weeks. Nobody puts their ugly lips around my bottle of milk and gets away with it." Union City is a 1981 feature film based on Cornell Woolrich's short story The Corpse Next Door, adapted for the screen and directed by Marcus Reichert. Dennis Lipscomb stars as Harlan, an accountant who becomes obsessed over the periodic theft of milk from his apartment doorstep; he pursues and assaults the homeless culprit (Sam McMurray), then tries to cover up the crime by hiding the body in a vacant apartment. Meanwhile, his neglected wife Lillian (Deborah Harry) strikes up a friendship with building superintendent Larry (Everett McGill) that becomes increasingly romantic as Harlan becomes more paranoid. Events come to a head as the vacant apartment is on the verge of being rented. 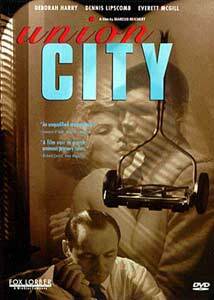 Union City was an early entry in the 80's revival cycle of films noir that included such movies as Bedroom Window and Body Heat. Writer/director Marcus Reichert achieves the right visual look and pulls off some pleasing shot compositions, but the film suffers in the story department. One gets the impression that this would have made a fine twenty-minute short; as it is, the short-story-based material is too thin to support a 90-minute feature. Some scenes seem redundant with others, and the film's style is too slow to achieve any intended black-comedy effect, while too light to convey a strong sense of drama or suspense. There's a reasonable sense of the 1950's period in the production design, but Union City ultimately feels like a student film—some elements work well, while others verge on the amateurish. The performances don't always impress either—while Dennis Lipscomb is effectively manic as the obsessive Harlan, Deborah Harry is often painfully stilted as Lillian and Everett McGill's Larry often seems confused and lost, though that may be a script problem rather than an acting issue. Irina Maleeva as an eccentric neighbor who calls herself the Contessa is sometimes annoyingly stagey. Pat Benatar and Sam McMurray contribute good supporting work, but the inconsistent quality and performance styles damage the film's credibility. Image Transfer Review: Fox Lorber's Union City DVD appears to have been mastered from a broadcast-quality videotape source, not film. Color bleeding and smearing abound (especially where reds are involved) and the image has a generally soft, slightly unstable quality with the heaviest edge enhancement I've yet seen on a DVD. The image is extremely murky in dark scenes, and the 1.33:1 aspect ratio appears to have been panned-and-scanned, cropped down from a 1.85:1 image (though I haven't been able to find any information on the film's original presentation.) Just not up to DVD standards, though I've seen worse, saving this one from "F" territory. Audio Transfer Review: Union City is presented with a Dolby Digital 2.0 monophonic soundtrack, presumably faithful to the original release's audio configuration. There's not much to discuss here—dialogue is reasonably clear given the age of the film, and Chris Stein's effective score comes through successfully. There's a bit of warble and distortion in the track, but next to the video the audio is acceptable. Fairly comprehensive "selected filmographies" for cast members Deborah Harry, Dennis Lipscomb and Everett McGill, though no biographical information is provided. A nice set of color behind-the-scenes photos, with "handwritten" captions that explain the circumstances of each photograph; the annotation makes this feature much more valuable than most DVD "photo galleries" and brings this grade up significantly. A series of 3 text screens, reprising the film's major credits and cast list; handy for reference, but not really "new" content. Union City is an interesting but ultimately less-than-satisfying attempt at a neo-noir film. Fox Lorber's DVD transfer suffers from poor video quality, though audio and supplements are acceptable. Rental only.